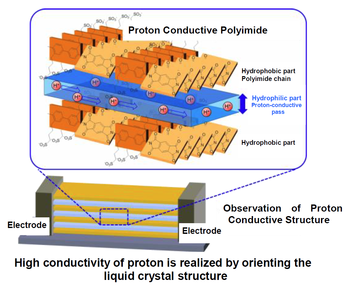 Dr. Shusaku Nagano, Associate Professor at the Venture Business Laboratory (Graduate School of Engineering), Nagoya University, and his co-researchers have reported a liquid crystal molecular structure that enables high proton conductivity in proton exchange membrane.1 Their paper has been published online in the Journal of Materials Chemistry A on March 27, 2014. Recently, fuel battery has attracted considerable attention as a potential environmentally friendly energy source alternative to fossil fuel. To lower the cost and improve the performance and durability of the fuel cells, there needs to be significant improvements in the various components of the fuel cell. In particular, the proton exchange membrane, which forms the heart of the fuel cell, plays an important role in proton transport. The performance of this membrane is considered to greatly influence the power generation efficiency of the fuel cell. Conventionally, NafionR has been used as the proton exchange membrane. However, given the disadvantages of its high cost and complex production process, researchers have been long looking for development of a potential alternative to replace Nafion. 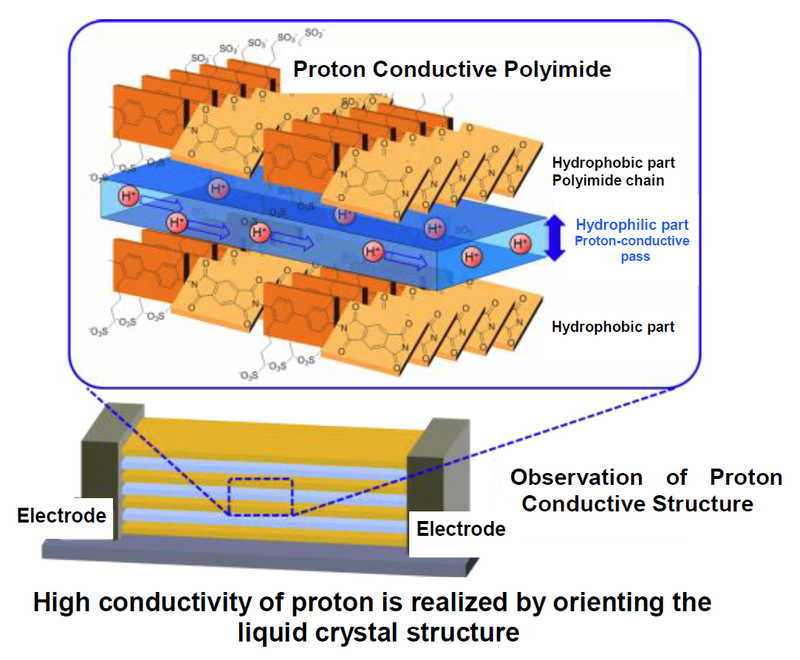 To this end, Prof. Nagano's research group has proposed an approach to improve the conductivity and optical property of the proton exchange membrane by orienting the molecules in the polymer materials. The research group analyzed the functionalities of a crystalline polymer, polyimide and discovered a difference in conductivity between the bulk polyimide and polyimide thin film. Interestingly, the conductivity of the polyimide thin film was almost one order of magnitude higher than its bulk counterpart. Prof. Nagano speculated that this phenomenon could have originated owing to the difference in molecular structure orientation. To gain deeper insights into this phenomenon, the research group systematically analyzed the molecular structure of the thin film. Results indicated that the orderly liquid crystal planar structure of the thin film facilitated high proton conductivity. In fact, the proton conductivity of the thin film is found to be almost five times higher than that of Nafion. Therefore, the use of this thin film as a proton exchange membrane in fuel cells is expected to improve its power generation efficiency. Previously, there was no notion of the important role played by the molecular structure of the polymer in determining its conductivity. However, the results demonstrated by Prof. Nagano's research group have clearly elucidated the correlation between the structure and proton transport properties of the polymer. The outcome of this research is expected to significantly contribute to the development of fuel cells with higher performance. Besides, the research will also open up new avenues in the field of protonics. 1. A joint research with Dr. Yuki Nagao, Associate Professor at the Japan Advanced Institute of Science and Technology, funded by the Japan Society for the Promotion of Science. Associate Professor Shusaku Nagano has actively conducted research in industrial farms and universities, collaborating with researchers in various scientific fields. His experience in discussing diverse topics with various researchers at Gakushuin University, where he obtained his B.S and M.S degrees, provided him the opportunities to conduct inter- and trans-disciplinary research. Currently, he is working toward the development of methodologies to control the orientation and nanostructure of functional polymers in devices at the Venture Business Laboratory, Nagoya University. "The organized nanostructure of polymer molecules is shown to play an important role in improving the proton conductivity. In particular, soft materials, such as liquid crystals and polymer macromolecules, are the main players in these systems that can control the proton flow in vivo. The outcome of this research is expected to contribute to the advancement of protonics." "Expertise is an important qualification for a professional research. But, at the same time, amateur and freewheeling thought process is also necessary for an original creative research. To me, sparkling thoughts and new ideas come up while discussing diverse topics with researchers in different fields. Research is all about exploring an unknown territory. Amateur researchers, who have just started their research career, have to freely express their opinions to experienced professionals without hesitation."